It's become increasingly difficult to compare Epiphone and Gibson Les Paul guitars like for like. 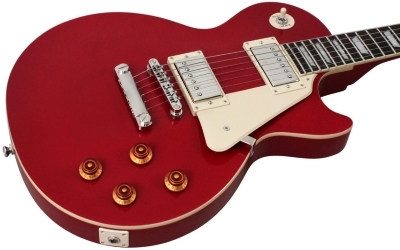 This is because both companies (Epiphone being owned by the almighty Gibson) produce a large number of LP models with various configurations of the classic cut. What this page will look at are the fundamental differences between the two brands, taking the Standards as the benchmark, and an evaluation of the general consensus surrounding the comparison. If you're on a tight budget (which you most likely are if you're on this site! ), then even a second hand Gibson Les Paul Standard may still be out of the question. So make sure you read up on the highest rated cheap les paul guitars available today. The latest (2017) USA Gibson Les Paul Standard comes in at a whopping $2,800 new. For second hand older models that don't appreciate in value, you're still looking at at least a grand. Compare that to Epiphone, with their version of the Les Paul Standard streeting at a modest $420. So is there really any comparison? Is the bottom line of this article inevitably going to be "you get what you pay for"? Well, to a certain extent, yes, and let's be honest - you already knew that! But there's a major caveat to consider here. I, and many experienced players, simply do not believe the Gibson Standard is worth six/seven times more than the Epiphone. When sheer value for money is the dominant criteria, as is the focus of this site, Epiphone wins hands down. Most Epiphone guitars are produced in China and, more recently, Indonesia, where labour is far cheaper than in the US. Even with the expense of shipping Epiphones to the west, the costs saved through cheaper labour far outweigh the additional transportation costs. There's also more "hands-on" craftsmanship in the Gibson USA production process, which can be seen with the more detailed finishes and impeccable fret work. This undoubtedly gives you a better quality instrument overall, but at a cost many simply can't afford. Bear in mind, no matter how much you spend on your next guitar, a professional set up, which can cost between $20 and $60, is always recommended to maximise playability. Although both the Epiphone and Gibson use the same type of materials (e.g. mahogany body), the materials used in Epiphone models aren't as rare as those selected by Gibson USA. The premium cuts on the Gibson contribute to overall higher tonal quality, more sustain and harmonic response. There are also differences with certain components, such as the tuners ( standard 14:1 Grovers on the Epiphone, 18:1 Locking Kidney Grovers on the Gibson), wiring, output jack, neck relief and bridge hardware. There's more "hands on" construction in the Gibson manufacturing process and less machine construction overall. This means more scrutinised, human quality control through each stage of the production process. This can be as simple as how the guitar parts are glued and sanded. It all adds up to a higher quality instrument when it leaves the factory. However, many reviews reaffirm the consistency of quality coming from the Epiphone factories, something that used to be a real issue with cheap guitars, but quality control does seem to have improved significantly over the years. The 2017 Gibson Les Paul Standard comes in 4 flame top finishes, whereas to get anything snazzier than the basic plain top finish of the Epiphone Standard, you have to pay a bit more for a Plus Top model, which gives you that gorgeous flamed maple top. However, you can really see the difference in detail between the flame on the Gibson Standard and the tamer Epiphone Plus Top. The Gibson Standard has a softer finish, which lets the wood "breathe" more compared to Epiphone's harder, polyurethane finish, which can affect tone. There's no doubt that the humbuckers used in the Gibson Standard are superior to those in the Epiphone Standard and Plus Top models. If you did want to change the stock pickups in the Epiphone to Gibson's Burstbucker Pros, it'll cost you around $300 (not including fitting). The Gibson USA Standard also features coil splitting which, in short, allows you to pop up the volume knobs for more tone variation, making it more versatile. Since the Epiphone Standard features the Alnico Classics, without the split coil, the cheapest Epiphone model that'll give you the coil tapping feature is the Plus Top Pro, for which you'll pay $100 or so extra on the original Standard. How an instrument feels in your hands is a very subjective thing. But the general consensus is that the Gibson Les Paul plays more comfortably than its cheaper counterparts. While it's easy enough to cost out the difference in raw spec, it's much harder to assign a numerical cost value to good feel and playability. Only you can decide how much that's worth. 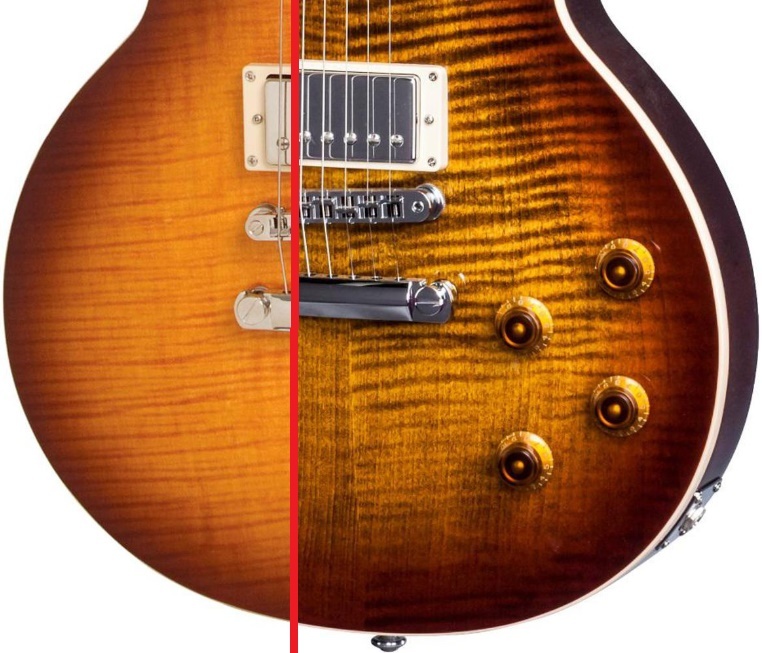 To keep things focused, we're just comparing the classic, non-tapped humbucking tone between the Standards for which the Les Paul is most well known. There is a clear consensus of opinion that can be drawn from the hundreds of reviews. With the better quality materials and electronics, the Gibson delivers more of that defining, gutsy warmth for which players know and love the LP. Pick up the Epi with fresh ears and you'll hear that same satisfying richness and warmth, and to many the difference is subtle. But inevitably the cheaper woods, wiring and stock pickups remove some of the mid-range depth, sustain, harmonic response and crunch that truly gives the USA Gibson its wow factor. It's certainly true that less experienced players are less likely to notice much difference, if any, and this is a crucial point. If you pick both up in store and can't hear any major difference, or (as is perfectly normal) you actually prefer the Epiphone, then the extra couple thousand bucks would be better put towards a professional setup and a decent amp. There's also a key point to be made regarding how effects saturated your tone is. If most of your tone shaping is done on your pedal board and/or via digital processing and modelling, it may be worth considering the Epiphone even if you have the money for the USA. It will still give you that sweet Les Paul base tone on which to layer your effects and EQ. Below I've selected some videos that compare the Epiphone and Gibson Les Pauls. It's just a flavour, so don't go making foregone conclusions! But if anything, you'll appreciate just how subtle the difference in sound really is - a credit to Epiphone. Answer: the first one was the Gibson! What many players tend to do is buy the cheaper Epiphone and change anything from the stock pickups to the volume/tone pots, pickup switch and even tuners. The idea is that you use the money saved on the cheaper stock axe to upgrade to something even closer to the USA Standard (or your chosen spec), still for a fraction of the cost of a USA made Gibson. If you know a good guitar tech in your area, they'll be able to give your new Epiphone the care and attention it needs to bring out its full potential. Of course, all the above may not even be necessary if you're happy with the tone and feel of your Epi. Both are great guitars. No question. The Epiphone Les Paul Standard gives you 90% of the look, feel and tone of the Gibson. The question is, are you willing to pay the one or two grand more for the extra 10%? But if, like me, $1,000+ is simply too heavy a hit to your finances, you will not be dissappointed with the Epiphone. Just don't be tempted by a further $150 saving on the inferior LP-100 - save up for the Standard or Plus Top Pro.